Ryuki Akira gets to grips with Nintendo's 3DS XL. Is bigger better? Why isn't there a second analogue stick? Is it too big to comfortably carry around as a portable console? Read the review and find out. The Nintendo 3DS XL is the hardware equivalent of the Nintendo DSi XL released on March 5th 2010. It's essentially a larger version of the original Nintendo 3DS design. 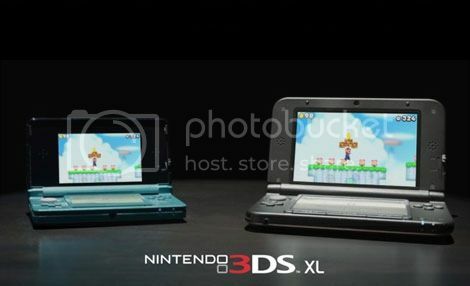 The Nintendo 3DS XL boasts a 90% larger screen size. I can safely say that this is the largest portable console released by Nintendo to date, even larger than the Nintendo DSi XL. Along with the size improvement, general hardware materials for the casing have been changed from a plastic gloss to a cheaper looking matte plastic. Other than finger prints now being less of an issue with the matte plastic casing, the overall feeling is a little more comfortable/satisfying on your fingers. However, if we were to talk about long-lasting comfort, I feel the general design of the Nintendo 3DS XL isn’t very comfortable when compared to the original, smaller design or even the PlayStation Vita. My main gripe is that the back area of the console offers no natural grip area for your fingers. This results in fatigue if you’re holding up the console for too long, or if you’ve no need to use the left and right bumper buttons, which effectiviely act as an anchor for your fingers. I feel the casing on the new Nintendo 3DS XL feels a lot cheaper; I had a particularly bad experience when ejecting the SD card, as it resulted in part of the casing coming away from the body. Its flimsiness reminds me of the skin shell on Cadbury's Mini Eggs. Other physical improvements are the buttons and sliders. The volume and 3D slider feel more solid and less flimsy compared to the original, and the “Select”, “Home” and “Start” buttons are now more prominent and stick out further. The screens and graphics have also been upgraded; with the display now reducing sunlight glare from 14% to now just 3%. The larger top screen also gives a slightly greater depth of 3D due to the parallax nature of the layering process, which I have to admit is impressive, specifically in more recent titles like Kingdom Hearts: Dream Drop Distance. I tested various titles from the 3D library, and I'd say that the conversion process is satisfying, with no real loss in quality. Testing older titles from the NES, Gameboy Color and Gameboy Advance library was a different matter. The image quality still looks very good on a larger screen but some Gameboy Advance titles might suffer a loss of quality. The colours are a bit more washed out and the sharpness has been reduced, along with a somewhat “zoomed” effect that's present on every title. I wouldn’t say it's atrociously ugly looking, but even most PC/MAC emulators produce a much crisper image at custom resolutions. Battery power has been upgraded, but it's barely noticeable, however you can’t really complain about this as all the new generation of handhelds and mobile devices tend to suffer from this problem. It’s going to take another generation of tech before this improves. The original stylish metallic retractable stylus has been replaced with a cheap-looking non-retractable solid matte plastic one. I wasn’t too chuffed with this - another decision at keeping costs low, I’m sure. Nintendo has tried to add more value for money by including a 4GB SD card that comes standard, which is 2GB more than the. However, this generosity is juxtaposed by the decision to exclude an AC Adapter with the EU/Japanese versions of this console. In general there is really nothing more to say about this console. Sure, I will admit the original 3DS was very small and quite unsatisfying to look at, however it did do the job regardless of your feelings on current 3D technology. So, is it worth it? The answer is that there's no real straight answer. There are several things Nintendo could have done to make this a much more attractive deal. If you don’t already own a Nintendo portable console, you won’t own an AC Adapter and will have to purchase one separately. When you consider the extra cost, the price bumps up to near £200, creeping ever closer to the original 3DS’s launch price. I'm also disappointed in the lack of a 2nd nub stick as I felt the larger iteration of this console would have been a fantastic opportunity for Nintendo to upgrade their overall design to compete with the PlayStation Vita. Even though Nintendo will offer a future add-on to remedy this, I feel that all these little “extras” you need to buy just add to the overall price of the console. It’s something that really should be included with your original purchase, as it's cumbersome and unnecessary to have so many additions not present in the original design. Overall, I would say that the satisfying aspects are that the screen is large and therefore adds that extra depth of 3D. The general design does feel more comfortable, but it's generally a lackluster update. The original 3DS looked a little more classy and expensive, so you could almost forgive it for not having a 2nd nub stick due to its size. It all depends on how much money you want to spend, and if this is your first portable console. If you're a collector, You're going to buy it anyway. However, if you're new to portable console gaming, I would look into the original 3DS that is being offered for a much cheaper price. In summary, it’s a wasted opportunity by Nintendo to capitalize on a feverishly competitive portable market. As it stands, the 3DS XL is merely an option, and not a necessity.